United Tool and Fastener  is proud to be a part of the upcoming 1st annual Construction Career Collaborative (C3)  career fair on Thursday, April 4, 2019 as a sponsor and safety representative. The event, which will be held from 7am to 3pm at the Fort Bend ISD Wheeler Fieldhouse in Sugar Land, is part of a greater C3 initiative to educate students about careers in construction. UTF Safety Specialist, Charlie Gertson , will be at the C3 Career Fair in Fort Bend to demonstrate safety protocols and equipment to the students. Some ‘lucky’ students will even be able to participate in the demonstrations  by being strapped into safety harnesses and pulled up above the ground to showcase how safety harnesses are supposed to fit. The goal of the career fair is to ultimately pair trained and employable high school seniors who are enrolled in career and technical education programs with companies in the construction industry. As many as 1,200 students from Aldine, Lamar, Alvin, Alief and Spring Branch areas are expected to attend the event to learn about careers in the construction industry. In Spring 2018, UTF participated in the Texas Construction Career Initiative (TCCI ) High School Construction Career Day at the Freeman Coliseum Expo Hall in San Antonio. 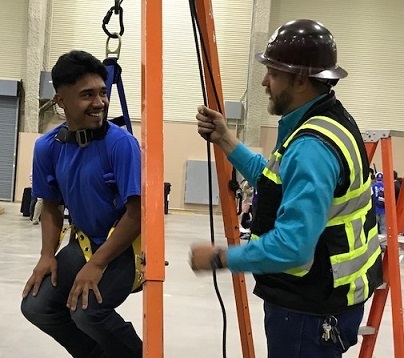 UTF Safety Specialist, Charlie Gertson, gave hands-on presentations to more than 600 students from at least 32 schools in the greater San Antonio area about various construction safety issues, including safety harnesses. To learn more about the safety equipment or safety classes offered by UTF, please contact Charlie Gertson at 713-823-9016 .